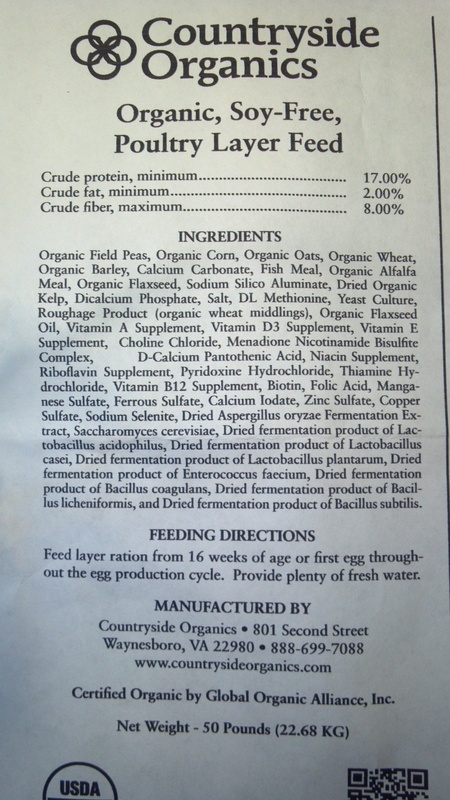 Organic Hen Feed? Sorry, Not Interested. I’ve just heard on NPR this morning that the current price for organic soy beans (mostly imported from China) has risen to $800 a ton – roughly twice what it was last year. This has put commercial organic chicken raisers and their customers in a financial bind. For those of us raising our own birds the price and quality of feed is also an issue. 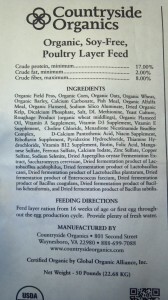 Late last summer our hens were gifted a 50 pound bag of Countryside Organic, Soy-Free, Poultry Layer Feed. 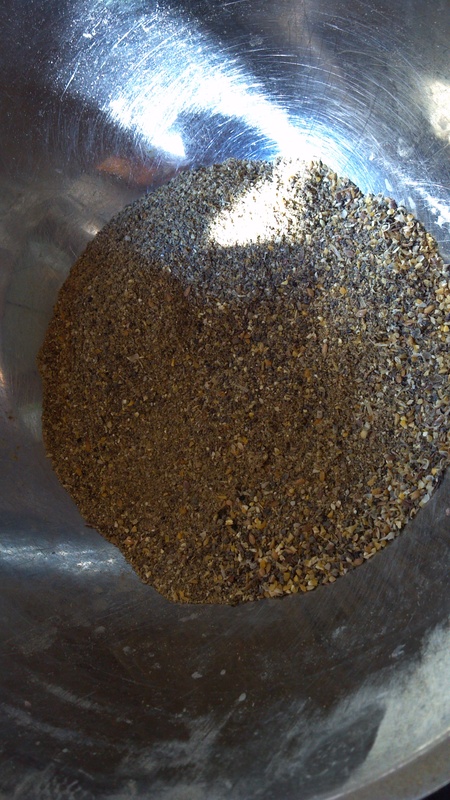 We have for many years used the non-medicated layer crumbles we buy from Southern States so we were interested to see how this popular organic feed would go over in our henhouse. We keep 20-30 laying hens on average throughout the year. Most are Buff Orpington, with a few Rhode Island Reds, and a Red Ranger or two thrown in for variety. They have always been consistently good layers and do well on the feed we supply along with cultivated patches of buckwheat, oats, sprouted oat greens to add to their feed or they run in fenced sections of our garden as it is harvested. The hens get all the kitchen refuse, all the garden refuse, and comfrey leaves from our large row on a regular basis and are let to run in fenced off areas of grass when possible. 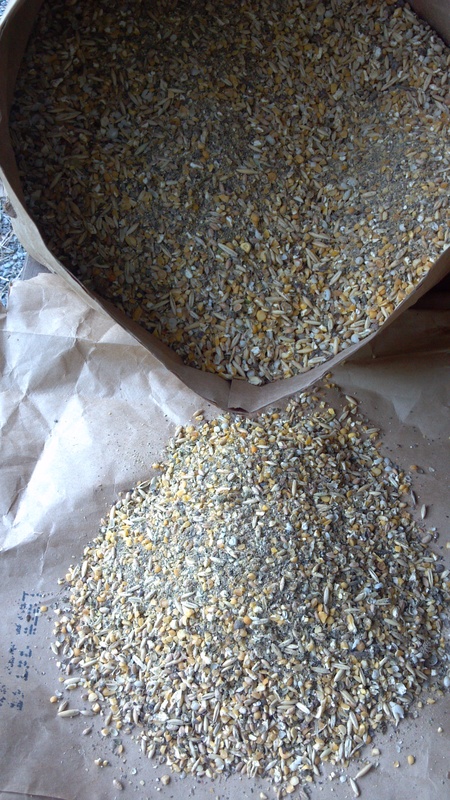 When we opened the bag of this new feed my husband and I were both very startled at what it looked like; a dusty, weed-seed mixture of what appeared to be cracked grains and unidentifiable pieces. But this brand seems to be popular with many of our local small backyard flock-holders so we decided to let the hens themselves tell us if they liked it. We hung another feeder in the pen, filled it up, let the hens have it free feed. Within the hour it was quite clear that the new feed left a lot to be desired; the girls had rooted through the ‘dust’ tossing it on the floor of the hen house while leaving many of the larger ‘seeds’ in the feeder. If there were indeed field peas they were almost unidentifiable and I could not pick out anything but pea hull, the cracked corn was in tiny pieces, so the oats, wheat, barley were the most visible in the mix. I needed to have a better sense of what was in this feed. So I decided to sift a scoopful. And this is what I found . . . . . . I measured out 1 pound 8 oz. of the feed into a fairly small screen colander and separated the whole or partial ‘grain’ from the dust. After screening the grain and seeds measured 15 oz. and the powdery dust was 8 oz. Then I picked out the largest of the weed seeds from the grain. So far not too good a deal. The vitamin/supplement amendment count came to 44 items more or less – I got lost in the closely spaced list and am not going to try typing them all. I hope the above picture image gives some idea. 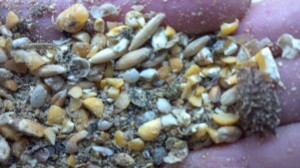 This was the ‘dust’ my hens had twitched out of the feeder with such disdain. I’m sorry to say it seems like a real cheat to me; pricy feed to con the gullible. We finally just used the remaining product to scatter as scratch. I guess the ‘amendments’ will enrich the soil. It would be possible to make a hot wet mash with this feed but I can hardly imagine doing that on a routine basis. All this is by way of a cynical note to the over enthusiastic crunchy-granola crowd of small flock keepers; just buy the least expensive non-medicated feed you can. The very fact that you are keeping your own hens and feeding them your kitchen garbage and garden gleanings and treating the birds like the food-partners they are should make you proud you are producing great eggs for your family.